Unlike other kinds of begonias, tuberous begonias grow from tubers. Begonia is one of the largest genera, with over 1500 species. These herbaceous plants or subshrubs occur naturally in semi-tropical and tropical regions around the world. 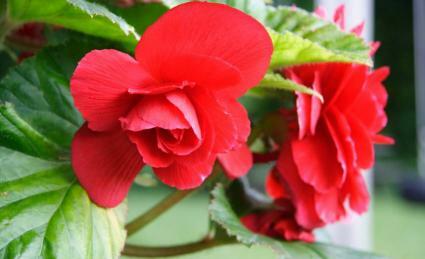 Begonias are grown in gardens for their flowers or foliage. Many hybrids are also in cultivation; the genus is unusual because all species can be hybridized with one another, even those that originated on different continents. Begonia growers categorize these plants into several major groups, but the groups do not correspond with formal botanical categories. The genus was named in honor of Michel Bégon (1638-1710), a French amateur botanist who collected begonias from Santo Domingo while stationed he was there with the French navy. Tuberous begonias were discovered by Richard Pearce, an Englishman, in 1864. 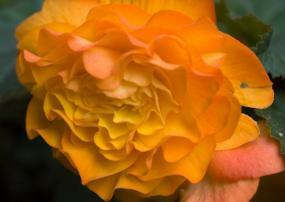 Tuberous begonias are grown for their flowers, although a few types have interesting leaves. They are divided into 13 groups based on flower type or growth habit. They are described as singles, doubles, daffodil-flowered, single frilled, camellia-flowered, and so on, based on the shape of the flower. A great range of colors are available in cultivation, including white, cream, yellow, scarlet, crimson, pink, red, and orange. Some flowers are bicolored. There are no blue flowers. Some tuberous begonia flowers are scented. The plants range from trailers to sturdy upright plants. Most tuberous begonias grow to about 12 inches tall, but some varieties may reach up to two feet. Tuberous begonias are phototropic, which means that both flowering and dormancy periods are triggered by daylength. They will begin to flower when daylength reaches 12 hours a day. Many growers remove the first buds, which delays flowering but encourages larger flowers. These plants are not fussy about soil type or pH levels. They will thrive in any good garden soil with humus added. Good drainage is essential! Raised garden beds or those positioned so that water drains away from the bed are good choices. If you're growing tuberous begonias in containers, make sure there are plenty of drainage holes and add small stones to the bottom of the container to improve drainage even more. These plants flower heavily while storing nutrition in their tubers for future growth, so they are heavy feeders. Most growers use a balanced fertilizer early in the season to promote plant growth and a bloom-promoting fertilizer later in the season. Tuberous begonias thrive in light or dappled shade. They do not do well in full sun. They are easily damaged by wind or heavy rain, so they should be planted in a sheltered location. These begonias begin to go dormant when daylength shortens in the autumn. When they start turning yellow and dropping leaves, gradually limit water to stimulate dormancy. In frost-free climates, tubers can be left in the ground or in their pots all winter as long as the soil is dry. The tubers are vulnerable to rot, so if the soil will be wet, it will be necessary to lift and store the tubers. In cold areas, freezing weather will destroy the tubers, so they must be lifted and stored each fall. The tubers should be started into growth in late winter. Move the tubers from their cool storage area to a warmer place until they begin to sprout. Once the sprouts are visible, the tubers are ready to plant. Use a light soil that contains no fertilizer. Bury each tuber completely; the roots develop from the tops and sides of the tubers. Water lightly, being sure the soil drains well. It should be evenly moist but not wet. Place the potted tuber in an area that receives filtered sunlight and has an average temperature of 60 to 70 degrees Fahrenheit. Water only when the surface of the soil is rather dry. They can be repotted as needed. Tuberous begonias can be moved outside or bedded out after the last frost. If you are bedding out, bury each tuber at the same depth it had in the pot. You can increase your tuberous begonias by cutting the tubers into sections with a sharp knife before potting them. Be sure each section has a bud! Treat each section as if it were a complete tuber. Tuberous begonias are popular container plants, and the trailing kinds are often used in hanging baskets. They can also be planted in flower beds. Tuberous begonias are sometimes attacked by aphids, spider mites, and whiteflies. These pests can be controlled by beneficial insect predators or a spraying program. Powdery mildew is occasionally a problem. The best control is to increase air circulation and avoid overhead watering. Fungicides can be used if required. The tubers and roots contain oxalates, which are somewhat toxic. Eating them may result in a burning sensation in the mouth, difficulty in swallowing or speaking, and sometimes nausea and vomiting.